This issue of Immunology and Allergy Clinics of North America, Guest Edited by Amy D. Klion, MD and Princess U. Ogbogu, MD, is devoted to Eosinophil-Associated Disorders. Drs. 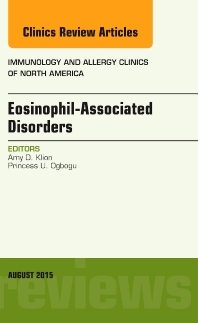 Klion and Ogbogu have assembled a group of expert authors to review the following topics: Evaluation and Differential Diagnosis of Persistent Marked Eosinophilia; Spectrum of Eosinophilic End Organ Manifestations; Eosinophilia in GI disorders; Eosinophilia in Hematologic Disorders; Eosinophilia in Rheumatologic/Vascular Disorders; Eosinophilia in Pulmonary Disorders; Eosinophilia in Infectious Diseases; Eosinophilia associated with Immune Deficiency and Immune Dysregulation; Eosinophilia in Dermatologic disorders; Management of Hypereosinophilic Syndromes; and Novel Therapies for Eosinophilic Disorders.